Previous research on sarcophagi has focussed primarily on the stylistic and iconographical evaluation of their figured decoration, treating them as autonomous works of art and separating them from their original context, the graves. This paper instead aims to reunite coffin and context by evaluating the original setting of the sarcophagi, their position in the tombs and the funerary cult taking place around them. In this paper, I will limit my considerations to urban Rome and its suburbium in the 1st - 3rd centuries of the Imperial Age. First I will show how the lay-out of the sepulchres changed in the course of the centuries, presenting a short chronological overview of the placement of sarcophagi inside the burial chambers. In the second part, I will give a brief introduction to the funerary cult practices within the tombs. Most sarcophagi that have been found in their original context in urban Rome and vicinity stood in chamber tombs or hypogea. In the 1st century A.D., i.e. before the beginning of the large scale production of sarcophagi in Rome in around 120 A.D., most burial chambers were rather spacious and lacked permanent architectural installations such as niches or masonry bases for the set-up of the sarcophagi. At the same time, the lay-out of many cellae is completely concentrated on the sarcophagi, as there were no distracting wall decorations or other burials except the stone coffins, thus manifesting that the sarcophagi were part of the tomb's original interior from the beginning. 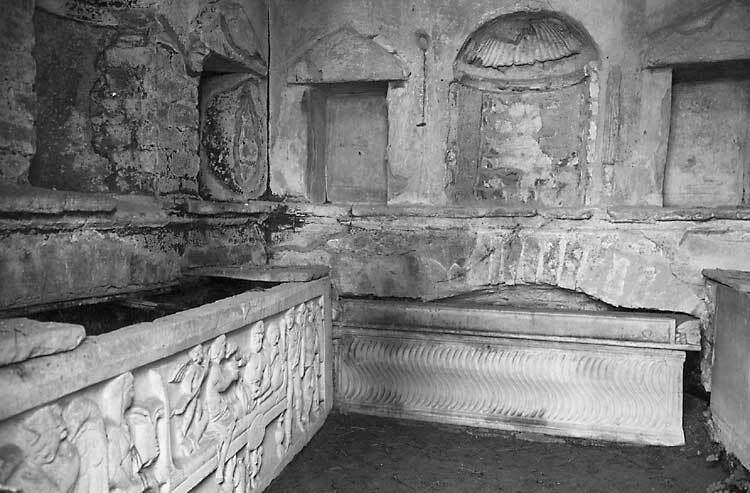 Until the early 2nd century, most sarcophagi were set against the wall as in the so-called Flavio-Trajanic "Ipogeo delle Ghirlande," excavated in 2000 in Grottaferrata, or placed in the middle of the room as in the so-called "Tomb of the Pancratii" on Via Latina built in the Flavian period. Throughout the 2nd century A.D., there were burial chambers with sarcophagi well integrated into the original lay-out. The most frequent position for a sarcophagus inside these chambers of the middle and later Imperial age was in a niche. This niche could be originally designed to accommodate a sarcophagus, as in the so-called "Tomba della Medusa" of late-Hadrianic date on the territory of the Policlinico, or in the "Hypogeum of the Octavii" from the late 2nd century on Via Triumphalis. In both structures, there were no obviously visible burial places in the cellae except the stone coffins. In other tombs, niches were not originally intended for sarcophagi. One example is the late-Hadrianic tomb 11 of the Isola Sacra necropolis near Portus Romae that contained three arcosolia with trench graves for inhumations (fig. 1). One of these niches was reused in the later 2nd century to insert a sarcophagus. Not only did the original burial in the trench grave underneath the arcosolium become at least partly inaccessible due to the set-up of the sarcophagus, but parts of the niche's arch, including plaster and wall painting, had to be destroyed as well, because the small strigilated sarcophagus was still too large for the arcosolium. This remained unrepaired, creating a somewhat untidy overall impression of the burial chamber. The second most documented of the possible ways to set up a sarcophagus was to place it on a masonry base or pedestal. This kind of architectural installation does not occur in the early Imperial age, but is constantly popular throughout the 2nd and 3rd centuries. Only seldom masonry bases were part of the original lay-out of the burial chambers. One of the few examples is the so-called "Tomb of the Valerii" on Via Latina, built around 160 A.D. In most cases, masonry bases for sarcophagi were added later though. An example can be found in the anteroom of the "Tomb of the Pancratii" on Via Latina. There, two pedestals in the shape of arcades were built against the back wall and the wall opposite the entrance in a later period, as well a third pedestal in the shape of a solid masonry block next to the entrance. When this hypogeum was excavated in the 19th century, four sarcophagi dating to around 270 A.D. stood on the three pedestals, and two further coffins were on the floor. This way, the anteroom was completely full. Further, the entrance to the main burial chamber with the huge house-shaped coffin mentioned above was blocked by seven sarcophagi, dating from around 150 to 230 A.D., that were carelessly dumped into the cella. Obviously, these sarcophagi had been removed from the vestibulum to make room for new coffins, possibly when a new proprietor took over the tomb. At this point, only the anteroom seems to have been in use, as the actual burial chamber was inaccessible. The older graves, i.e. the earlier sarcophagi containing burials, seem to no longer have been of any significance. While the sarcophagi in niches and on pedestals occupied privileged positions within the burial chamber, a considerable amount of sarcophagi in Rome and vicinity were instead completely hidden from view. Several sarcophagi were buried in trench graves (fossae), some of which were additionally sealed with cement. Other sarcophagi, especially in the late 3rd century A.D., were concealed underneath the floor of the burial chambers. For example, in tomb 34 of the Isola Sacra necropolis, erected in the 1st half of the 3rd century, three sarcophagi from the late 3rd century were buried underneath the floor in a hypogeal chamber. This chamber was created at the end of the 3rd century by destroying trench graves in the precinct of the tomb that had been part of the original structure and had already been used for inhumations. Some of the "invisible" sarcophagi, such as the early to middle-Antonine Aeneas-sarcophagus from a trench grave in Grottarossa or the strigilated Muse-sarcophagus from tomb 34 of the Isola Sacra, present a singular iconography without comparison and therefore must have been specially commissioned. In case of tomb 34, it is impossible to prove, if the three sarcophagi were used for the first time, or if they were reused. In case of a reuse, the reliefs might have had lost there significance. Another possible explanation for concealing the sarcophagi might have been the attempt to prevent violation, as especially the trench graves (fossae) such as the one in Grottarossa often contained a rich grave inventory. Before the corpse was laid into the sarcophagus for the actual burial, the body could be displayed in the family house for up to seven days. This lying-in-state is depicted on one of the reliefs from the "Tomb of the Haterii," dated to around 110/120 A.D. It shows a deceased young woman lying on a high funerary bed, surrounded by mourners. A man is placing a festoon on the deceased's body. There is evidence for this ritual in the nearly contemporary "Ipogeo delle Ghirlande," already mentioned above, as inside its two sarcophagi the bodies were completely covered with garlands made of real violets, roses, and lilies. Only one tomb with a sarcophagus, a trench grave in Vallerano south of Rome, allows us to trace some elements of the funeral ceremony that followed the lying-in-state. The sarcophagus was interred in a fossa sealed with cement and contained the burial of a sixteen to eighteen year old girl with a rich grave inventory that can be dated to the Antonine period. Inside the trench, but outside the coffin, several objects were found, among them a terracotta incense burner and a casserole. Based on these finds, it is possible to reconstruct that fumigations and libations must have been part of the ceremony. Other funerary rites were celebrated at the grave after the burial, reoccurring periodically. Ritual meals were part of many festivities honouring the dead, such as the purification ceremony following the funeral (cena novemdialis), the parentalia in February, the Feast of Violets in March, the Feast of Roses in May or June, and individual days of commemoration such as the deceased's birthday. Many tombs from the Imperial age, also those containing sarcophagi, were equipped with an oven and a well for preparing these banquets. Tomb 86 of the Isola Sacra necropolis, for example, presents a well, an oven, and masonry benches for the participants to sit on, installations that were added to a pre-existing chamber tomb in the middle of the 2nd century. This tradition of funerary banquets continued well into the 3rd century, as tomb 34 of the Isola Sacra that was equipped with a well and an oven as well illustrates. In many 3rd century tombs, there was not enough room to celebrate ritual meals though. While most tombs from the 1st century and many from the 2nd century A.D. were rather spacious and empty, as they often contained only the burials in the original sarcophagi, the burial chambers had been continuously filled with graves up to the 3rd century A.D. In many cellae, there was hardly any space left for visitors to enter and move around. One example for such a tomb completely stuffed with burials is the so-called "Tomba Aldobrandini" in Ostia Pianabella. When the building was originally constructed in the 1st half of the 1st century A.D., it contained only burials in several urns in the back wall and two trench graves underneath the floor with secondary burials. Successively, the burial chamber was filled with graves, until these earliest burials were no longer accessible. In the 1st half of the 2nd century, a strigilated sarcophagus on a masonry base was added and later partly covered by another grave built immediately against its front. At the time the latest burial was added, only a tiny space inside the chamber was left empty, allowing not more than one person to enter at a time. Still a set of used mid-3rd century cooking pots found inside the chamber seem to attest ritual meals or some kind of related cult inside the tomb. A similar case of a completely stuffed burial chamber is the "Tomb of the Pancratii" on Via Latina mentioned above. Another funerary rite attested at many graves are libations. For these dedications of wine, milk, or honey, special pipes were often installed allowing the liquids to spread either over the ashes or the inhumed corpse. Evidence of libations can be found in very few tombs with sarcophagi, and if so, these pipes or openings are never connected to the actual sarcophagi. Obviously this kind of cult dedicated to a particular deceased was not celebrated in relation to burials in sarcophagi. The question that results from this evidence is, if and to what extent cult related to a particular deceased was still celebrated in the later 3rd century A.D. In the burial chambers completely stuffed with graves, such as the "Tomba Aldobrandini" or the anteroom of the "Tomb of the Pancratii," it was simply not possible to reach the earliest graves that were already 200 years old at the time of the most recent burials in the tombs. Obviously, cult was no longer celebrated in direct proximity to the oldest graves. Generally, there seems to have been a loss of piety towards older graves in the late 3rd century. Not only were old trench graves destroyed to make room for burials in sarcophagi as in tomb 34 of the Isola Sacra, whole grave buildings could be destroyed, for example during the construction of the Aurelian Wall or, as in the case of the hypogeum of the famous Republican family of the Scipios, to build an apartment house above. In the latter case, the stone slabs with the inscriptions of the sarcophagi were even used as building material for the substruction of the insula. Further, the overall impression of the burial chambers often became unattractive and less representative in the advanced Imperial age as in the case of the damaged niche in tomb 11 of the Isola Sacra. In addition, the invisible sarcophagi of the 2nd-3rd centuries manifest that at least these sarcophagi cannot have been part of the rituals. A possibility could be though, that the funerary cult was moved to some place other than the stuffed and unattractive burial chambers of the later 2nd and 3rd centuries, since rituals continued to be celebrated as ovens, wells, and cooking pots show. The sarcophagus then must have made its impression elsewhere, if not during visits at the grave. Probably this was not during the funeral procession, not only because the pompa funebris is no longer attested except for members of the emperor's family in the Imperial age, but also because moving the sarcophagus through narrow doors, stair cases, and corridors must have been complicated and unattractive to watch. In most cases, the sarcophagus will therefore already have stood in the tomb before the funeral. It therefore seems most likely that the sarcophagus was presented during the lying-in-state, when not only the deceased was displayed, but also the sarcophagus and the offerings constituting the future grave goods. These signs of the family's affection and appreciation for the deceased thus created an alternative setting for the family's representation other than the crammed and unattractive burial chambers.